An OPC UA companion specification is now available for POWERLINK according to a joint announcement by the OPC Foundation and the Ethernet POWERLINK Standardization Group (EPSG). The companion specification describes how payload data is exchanged between POWERLINK and any OPC UA platform. The result is integrated communication from the sensor to the cloud – without any interfaces whatsoever. 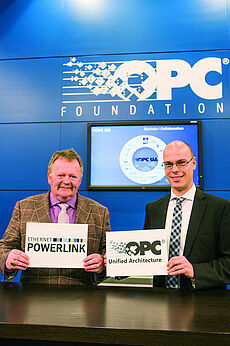 "As technologies, OPC UA and POWERLINK complement each other perfectly," emphasized Thomas Burke, President of the OPC Foundation, in his announcement. "POWERLINK is among the leading real-time bus systems used in plants and machinery. Together with OPC UA, POWERLINK networks can now communicate seamlessly and securely with the IT environment and into the cloud." "This specification allows OPC UA and POWERLINK to fuse into a single network," added Stefan Schönegger, managing director of the EPSG. "We're then able to join devices from different manufacturers and across different levels of the automation pyramid into a single, cohesive system." Thomas J. Burke (left), president of the OPC Foundation, and Stefan Schönegger, managing director of the EPSG, announced their collaboration on the now-published companion specification in 2015.